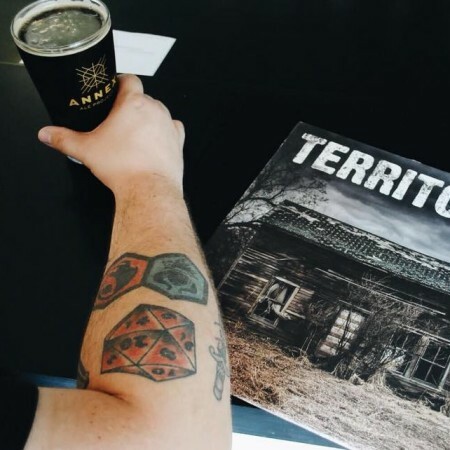 CALGARY, AB – Annex Ale Project has announced the release of a beer celebrating the self-titled debut album from Territories, a new group featuring the members of veteran Calgary punk band Knucklehead. It’s a North American Black Ale, or a Cascadian, or whatever the hell you want to call it. The important part is that it’s as black as your jeans and has a humungo citrus and pine aroma from all the Simcoe and Ekaunot we crammed in the dry hop. It also features an assertive chocolate flavour and a roasty finish without being bitter or astringent. Although it’s certainly seasonally inappropriate, it’s also wicked tasty. Annex will be hosting a listening party for the album tonight (August 10th) starting at 8:00 PM, with $5 pints of the new beer. For more details, see the Facebook event listing.